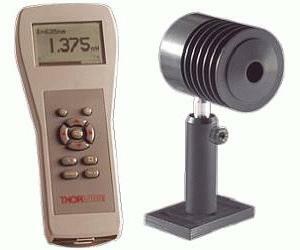 The PM200 Series Thermal Power Meters are multifunctional, handheld systems for high-power optical power measurements. All 200 series systems utilize thermal sensors which have very flat spectral response. They also all employ the same handheld console, which has a wide 40dB dynamic range and an extensive set of features and display options. The systems are all compatible with the full selection of S100 and S200 series sensors; thus providing a complete, extendable, and flexible solution for optical measurements in a broad wavelength and power range. The thermal sensor heads cover the spectral range of 250nm to 10.6μm and a combined power range of 20mW to 30W. Each sensor head is individually calibrated and the data is stored in nonvolatile memory inside the connector. The console immediately recognizes the sensor and downloads the appropriate information.